I was first introduced to Terri Lee Dolls by my grandmother, who was an avid collector of the dolls, and bequeathed a portion of her collection to me when I turned eleven, and she deemed me old enough to not only appreciate the dolls, but cherish them as keepsakes as well. She was right and my love for the dolls grew just as hers had. My grandmother had received her first Terri Lee Doll in 1951, and she had been collecting them ever since. Dolls are not just cold, hard collectibles, but they carry stories and history with them, and most are imbued with the emotions and passions of those who have dedicated their lives to preserving and collecting them. The Terri Lee Doll is no exception. Often these dolls are not only collected by doll collectors, but they are passed down through the generations as gifts to daughters, granddaughters, and children. The Terri Lee story begins, aptly, with two women – one who sculpted the doll, and the other who manufactured and marketed it. Maxine Runci was the daughter of Florence Lee, and Maxine was—from a young age—a talented artist and industrious young woman. Maxine grew up in Omaha, Nebraska, and after graduating from Technical High School, she attended the Municipal University of Omaha and worked in a department store, soon becoming responsible for the store’s doll hospital, which—as any collector knows—is the place you take your dolls to be fixed by a professional, if you have lost a button on a jacket, or an arm or stitch has come undone. It was after this experience that Maxine decided to establish her own doll hospital at her house, and she enlisted the assistance of her aunt to help. This gave both women ample opportunity to become experts in doll handling and upkeep, which assisted them greatly when—soon after—they decided to establish their own Terri Lee Doll company. At college, by this time Maxine had settled on an Art degree, and had begun drawing for fun and publication. After some drawings of hers were published in the local paper, a local organization banded together to help her pay the tuition fees that her family could not afford to send her to the prestigious Chicago Art Institute. Maxine attended the four-year Art Institute, eventually moving to California and meeting and marrying another talented artist, Edward Runci, who specialized in portrait work and painting. They had a daughter and Maxine continue to perfect her art, painting many portraits of her daughter and other young subjects. In 1945, Maxine sculpted her first doll, which she simply called, “a toddler doll” – and named this doll Drienne, after her daughter. Though this was the official name of the doll, both her daughter and the doll were better known by their nickname – Terri Lee. When Violet saw Maxine’s doll, she fell in love. A natural entrepreneur and businesswoman, Violet offered to dress and market it, and agreed to set up a trust fund for Drienne out of any profits the doll made. Thus, Terri Lee, Inc. was established, and Violet became founder and president of it, and its successor corporations. Vintage Dolls The true Vintage Terri Lee Dolls are the first ever sold, and even these were lucky in their start. Originally not allowed to be shown at the annual Toy Fair in New York City, because the doll was not a true “manufacturer’s doll,” a sympathetic manufacturer in the show agreed to showcase the doll in her booth, for free. The doll was an instant and incredible hit. One of the most unique aspects of Terri Lee Dolls is that each can be uniquely combined together with interchangeable garments, wigs, and hand-painted faces. The first commercial advertisement for the dolls appeared in Montgomery Ward Magazine in 1946, and 8,000 orders were placed for those first Vintage Terri Lee Dolls. The original (now vintage) Terri Lee Dolls were made of sawdust and ground-up corn cobs. These are difficult to find, and incredibly rare. After 1947, the dolls were made out of plastic, which itself was in its early days as a popular doll material. Thus, the first Terri Lee Dolls are unique and valuable because each mixing of plastic colorants produced a slightly different hue and color, so the Vintage Terri Lee dolls came out of their molds in every tint and hue imaginable. Some dolls were white, some were ivory, and some even were dark green. But because each was also fully hand-painted again, from top to bottom, these mold colors mattered little, until of course the dolls became major collectors’ items. Collection Types Another unique aspect of Terri Lee Dolls was the way each was marketed and made one-of-a-kind. There are many different Terri Lee Doll collection types, and this is because Violet decided early on in her marketing that each new Terri Lee Doll would use a newer, heavier plastic that could be pre-tinted to a more natural “skin” tone, and each doll would leave the factory with a small booklet tied around its wrist. Another distinction between the various Terri Lee doll types comes from the type of plastic used in the mold creation. The Terri Lee Dolls were at the forefront of the industry when plastics was first being experimented with in toys and doll-making. Violet was a true innovator, and was never satisfied with her first attempt. When new plastic compositions were created, she was one of the first businesspeople to adopt the new material into her dolls. She even hired a top engineer to research injection molding for her, and ultimately Terri Lee Dolls utilized at least two Dow Chemical Company products in their first Terri Lee Doll molds. Collectors of these dolls know that sometimes different parts were created with different plastics, and even some parts that might have been replaced or added on later (in a doll hospital or the like) might have a different color original mold. One way to identify a true Vintage Terri Lee Doll, one of the first ever made, is to examine its face. The earliest dolls have wiry wigs with fine lines cracking as the paint dries from their faces and bodies, while “second generation” Terri Lee Dolls are noticeably heavier than their predecessors, due to the switch to a new, tougher plastic mold. Another way to tell early generation Terri Lee Dolls is by the airbrushing red coloring on the knees, cheeks, and hands of the dolls. This was to give the dolls the appearance of a more realistic “blush,” and all the early features were hand-painted instead of airbrushed on. Value The value placed on Terri Lee Dolls can vary, but one aspect that determines a Terri Lee Doll value is what type of plastic the doll is made out of. This is because one type of plastic—ethyl cellulose—oxidizes and becomes brittle with age. This is why, if you see enough Terri Lee Doll collections, you will notice a fair number with chipped arms or legs, and sometimes—sadly—even faces. Unfortunately for collectors, old-fashioned cellophane also becomes brittle as it ages, and thus it is difficult to find original Terri Lee garments with the unopened packaging still intact, as the garments were sold in paper envelopes with a window box front of cellophane, which often crystallized and fell apart over time. Even the small booklets and strings with which these were attached to the wrists of the Terri Lee Dolls hardened and broke over time. 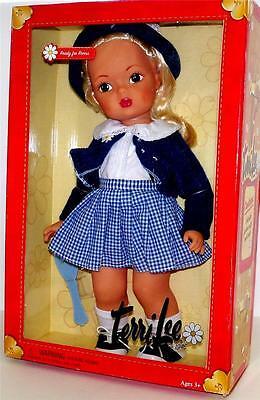 Thus, it is very difficult – if not impossible – to find mint condition Terri Lee Dolls. Collectors, however, should not fully despair, as proper storage of dolls (especially with the modern vacuum-tight options for valuables and dolls) can significantly reduce the decaying process by preventing the gases in the atmosphere to attack the composition of the paint and packaging on the dolls. Terri Lee Dolls were most popular between 1946 and 1962. Notable characteristics of the dolls include: dimples, a closed moth, big, painted eyes, elaborately detailed cloths, and the fabric daisy on the wrist. The most important contribution to doll design was the patented yarn doll wig, which could be washed, brushed, and styled. Terri Lee Dolls value has ranged over time, but even now auctions can be found selling the dolls for $200 to $700 dollars. You can find Terri Lee Dolls with reputable eBay sellers. Many collectors keep many Terri Lee Dolls in their collection, always searching for the next one that will round out their collection. Terri Lee Doll Clothes Terri Lee Doll clothes and parts were originally assembled, painted, wigged and dressed at a factory in Lincoln, Nebraska—a different location than where the dolls were actually produced from molds. One of the reasons Terri Lee Dolls became famous was for their fashions. Violet always wanted to make the dolls the most fashionable, well-dressed dolls available, and she began to put her own expertise as a seamstress to good use as she designed more outfits, and more elaborate costumes. At one point, it was reported that there were over 100 garments made for the Terri Lee Dolls, and each of these garments were interchangeable. The clothes themselves make the Terri Lee Dolls more collectable, as each was sewn by a dedicated woman, at one point there were over 500 employees creating the Terri Lee Doll clothes. The clothes were made both in home and the factory, and often the seamstress sewed her name and the number of garments that were to be made of that particular style onto a pattern, which they then fastened to the top of a stack of individual pieces. These tabs themselves were sought after by collectors, and of course the rarer garments were also more popular.